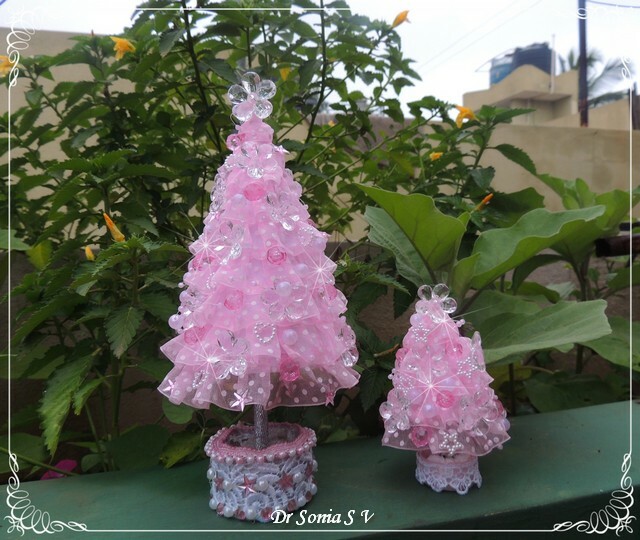 Hi friends, these cute DIY Mini Christmas Trees are my DT project for Maureen's Rudolph Days Challenge . I do not usually like to commit to many DT roles but Christmas projects always make me happy and I am so thrilled that I am DT for Maureen's awesome Challenge blog this year too. 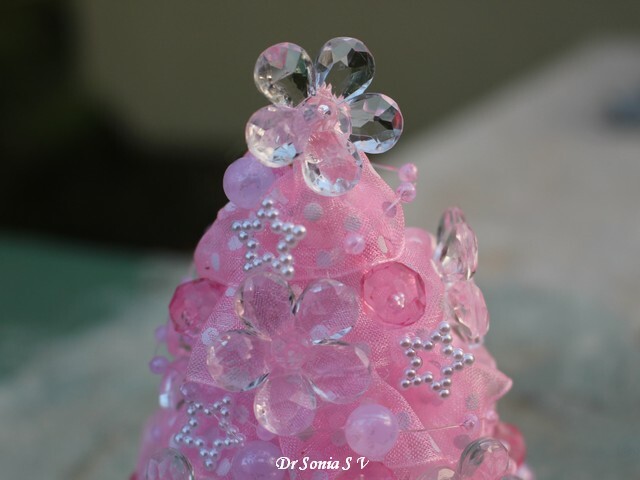 These little Mini Christmas Trees are very simple and quick to make but look glamorous enough to display in your home, gift to a special someone or even sell at craft fairs! 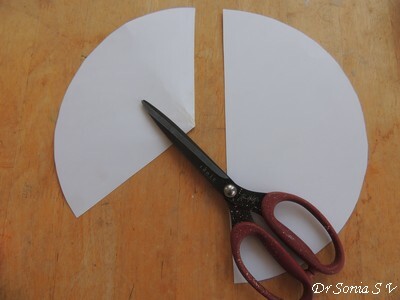 Circle cut from thick card stock/ ivory sheet - use a plate as a template to cut out a large circle or if you want to make a small tree, just die cut a circle. 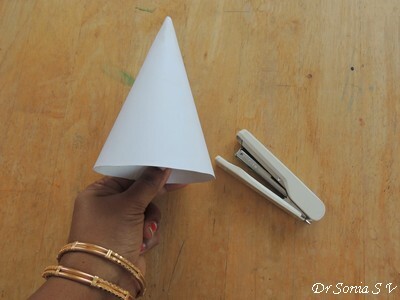 Snip off a segment of a semicircle and shape it into a cone. Once you are happy with the conical shape, staple the flaps in place. 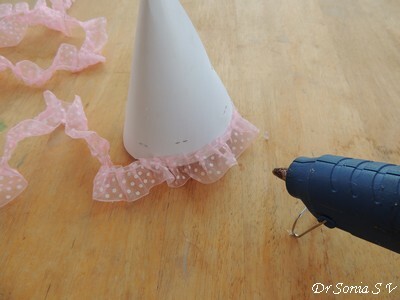 Apply a line of glue in segments of the paper cone starting from the base and stick the ribbon. 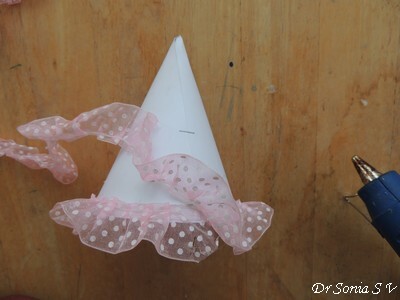 Stick the ribbon in a loose spiral around your cone. 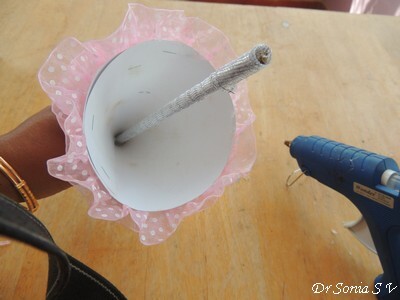 Apply hot glue to one end and stick it inside the paper cone. 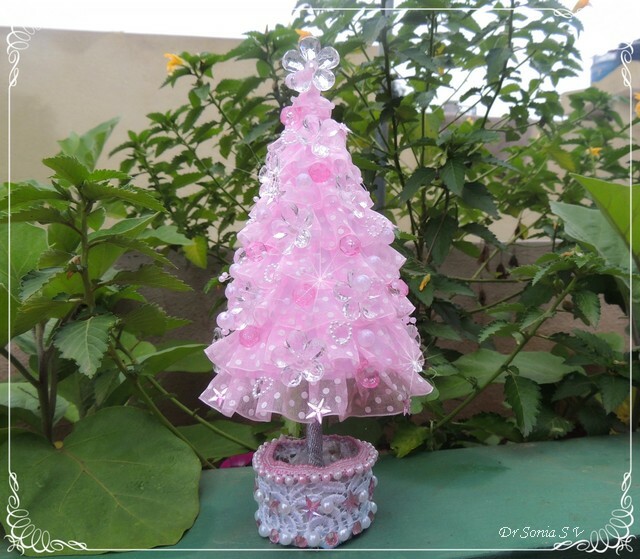 Dress it up with crystals and pearls and you have a lovely little tree! Quick and Easy!! Do join in at the February Rudolph Days Challenge . Maureen has some amazing prizes to give away and she will send it world wide! 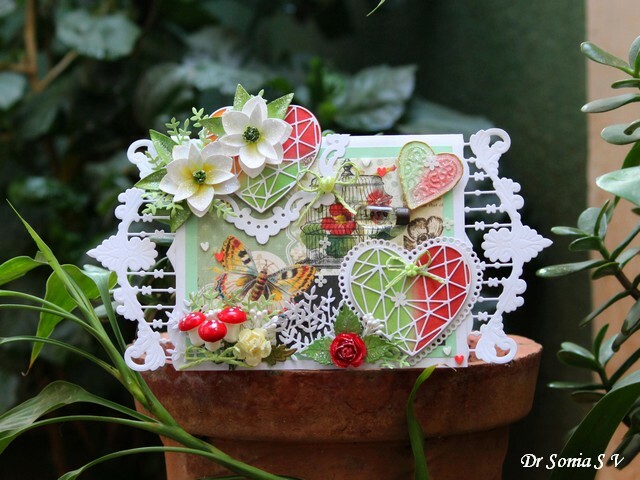 Hi friends sharing a romantic card with hearts and handmade flowers! 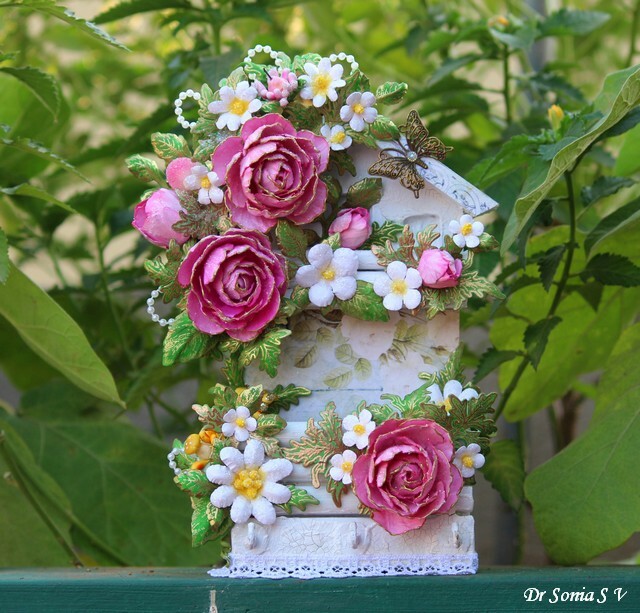 I made a little garden with butterflies in the backdrop , cute little mushrooms, roses and magnolia blooms. 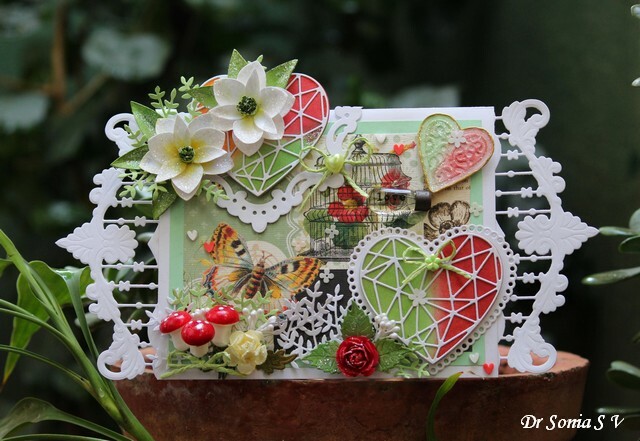 I blended distress inks to create a backdrop for the beautiful Winnie and Walter Hearts. The sparkling heart is a Sizzix lace heart embosslit die cut, inked with Distress Inks , jazzed up with sparkling dust[ from Dress my Craft] and highlighted with gold liquid pearsl. Couldnt resist adding a flower sequin atop! I had been hoarding the Prima typo bulb "love" for quite some time and finally persuaded myself to use it ! 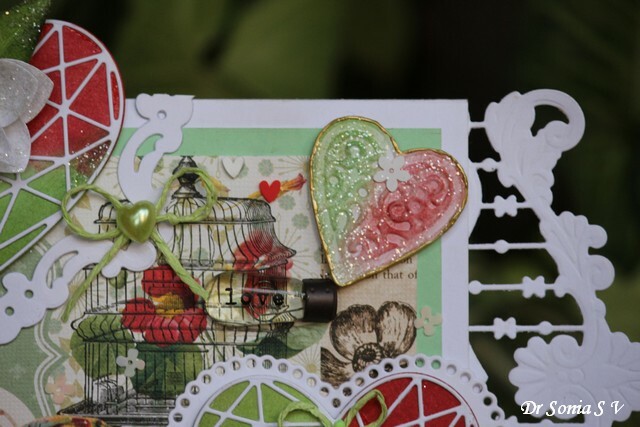 The tiny red and white heart pairs on my card are from Dress my Craft again...they are the cutest embellishments!! Am so happy with the way my magnolia flowers turned out. They were made with a Spellbinders Magnolia die and jazzed up with Dress my Craft Sparkling dust. I usually struggle to place sequins on my cards but this time I used flower sequins[ Dress my Craft pastel pink] and it was a bit easier!! The photo was taken atop a flower pot in our garden! How do you like it friends? Unstampabelles Feb Challenge : Have used New Spellbinders Magnolia Die, New Poppy Stamps leafy sprig die, New Sequins New Mushroom embellishments, New light bulb " love"
Winnie and Walter Off the Page Challenge with Keren: The top heart goes off the base of the card and the Marianne die cuts on either side go off the base of the card. Simon Says Work it wednesday Jan: Have used New Spellbinders Magnolia Die, New Poppy Stamps leafy sprig die, New Sequins New Mushroom embellishments, New light bulb " love"
Pixie's Snippets Playground - have cut out all the diecuts to make the flowers and leaves from snippets of scrap card stock! Hi friends, I made a home for the fairies in my garden with lots of glittery handmade flowers , magical vines and an inviting cozy fire inside! 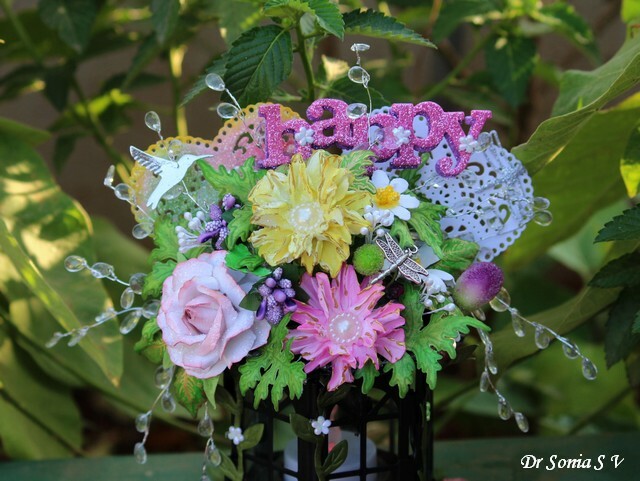 To add to the fairyland charm , there are sparkling cascading teardrop crystal sprigs, beautiful velvet vine trails, a silver humming bird and a "charming" dragon fly ! 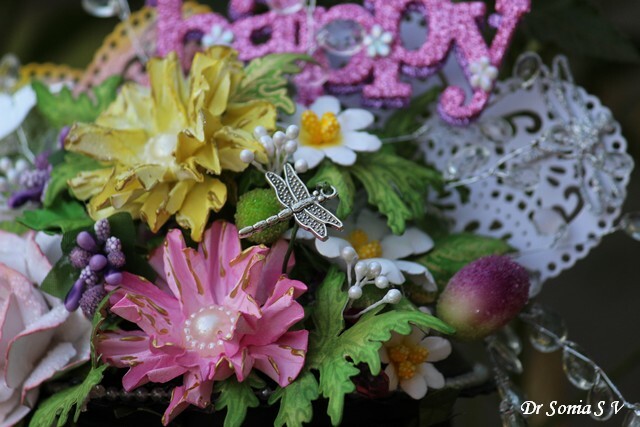 And of course the fairies do need a lot of sparkle and bling and cheerful colors to help make them feel "happy" at their home! 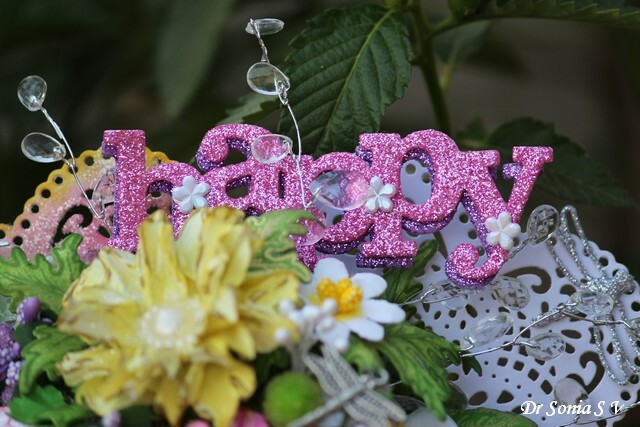 The glittery "Happy" has a backdrop of two large lacy hearts to add a bit of magical romance!! 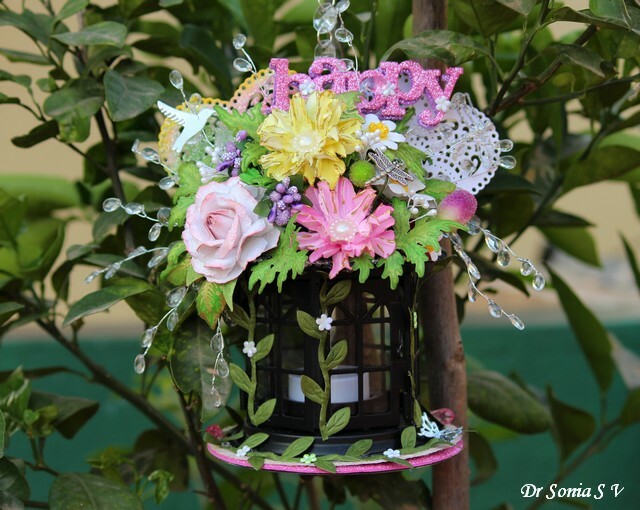 I hope the little magical beings will love to flutter with the dragon flies and fly among the sparkling flowers! The fairy home has a latched door which swings open and inside is a warm cozy light to keep the fairies snugly warm! 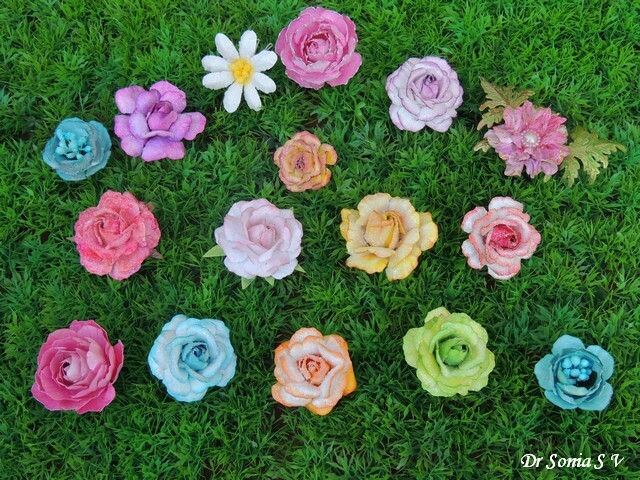 He he now back to serious human crafty talk....here are some of the handmade paper flowers I have been obsessed with making the past few days! 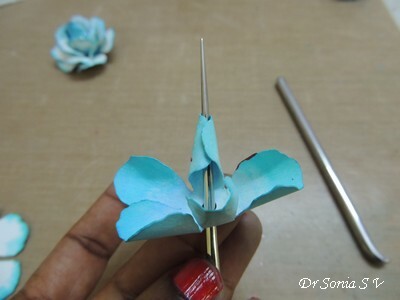 There are many many Tutorials on making a rose but since its such a tricky flower to make I always love to share if I find "easier" ways of making this beautiful flower!! 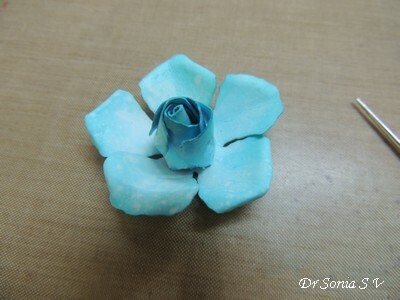 So lets jump right into the Paper Rose Tutorial- the easier way!! 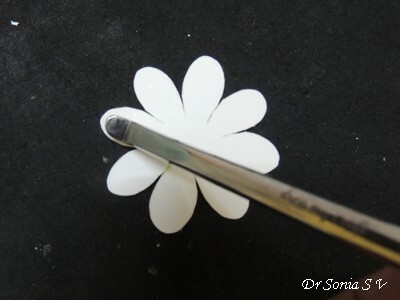 Flower Shapes : you can hand-cut, die cut or even punch [ but most punches wont punch very thick card stock] flower petal shapes. 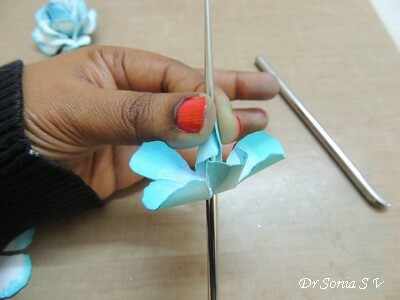 A 5 or 6 petal flower shape is the easiest to make a rose. 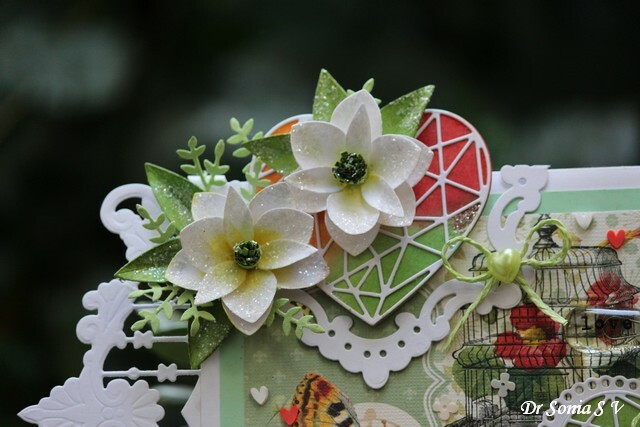 Here I used Spellbinders Rose Creations dies and used the 2nd largest die to get 4 die-cut flowers . 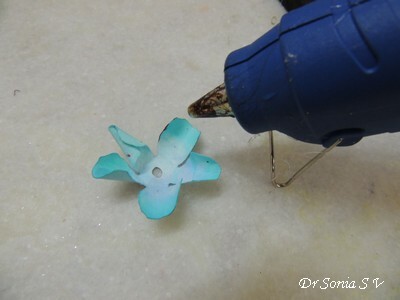 Adhesives : clear drying liquid adhesive or if you want to craft quickly then use a hot glue gun. Embossing Pad : I personally like the pads made of thick foam .You can alternately use a mouse-pad too. Mister and Towel. 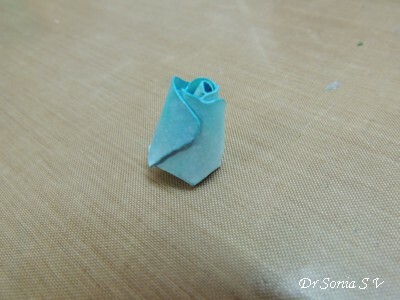 Since you are working with thick card stock you need to moisten your paper to be able to sculpt it. You can dip your flowers into a bowl of water but I find misting quicker and less messy. 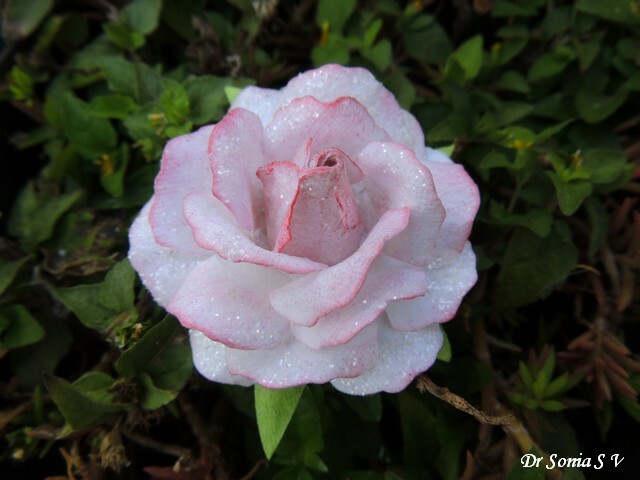 Use a paper towel of cloth towel to help mop dry your misted blooms. 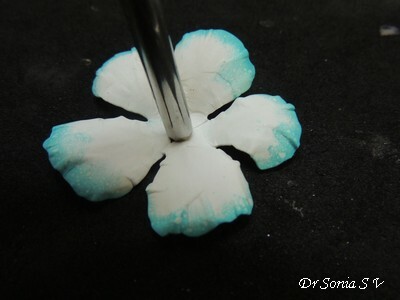 Use any 5 petal flower shape and color whichever way you want.Use one color, ink only the edges or use 2 different shades. 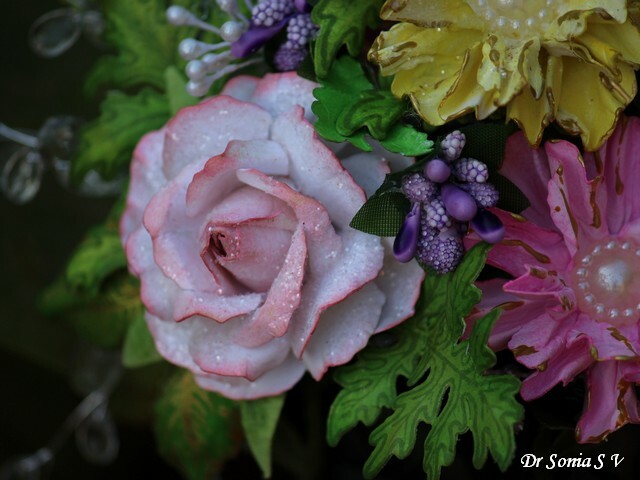 Just remember to color both surfaces of your flower as the rose is a 3 dimensional flower and you will see both sides on your final flower. Mist lightly with water and blot gently with a towel. 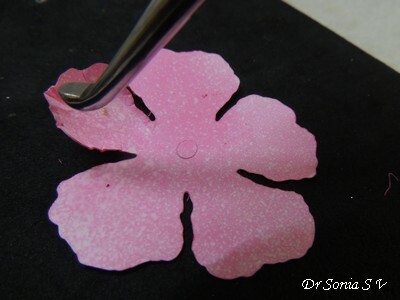 This is so much quicker than embossing with tools and much easier than simply trying to roll the petal into a cone using your fingers alone! 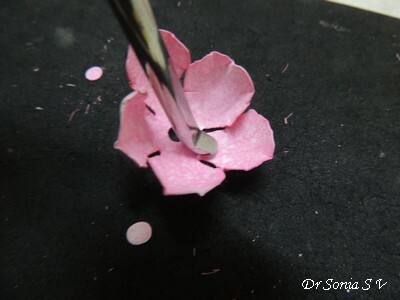 Do the same with all the petals of your flower. To form a nice pointed cone, now take the 2nd largest golf tool and wrap one petal around it...sliding it up to the tapering end and rolling into a tight cone. 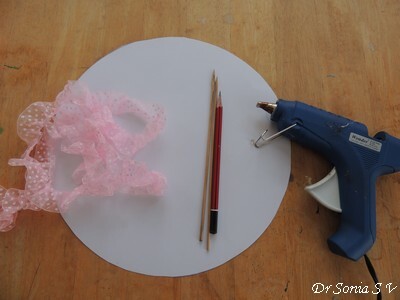 What I loved about the Dress my Craft paper is that not only is it super easy to shape by this method but also the shape stays nicely...see how the petal doesn't uncoil immediately but gives time to glue! 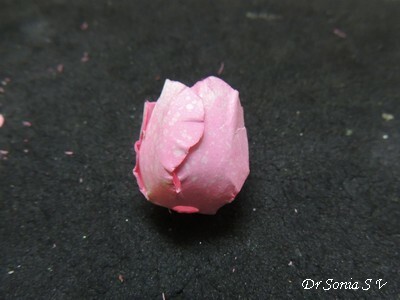 You need to do this with only one petal which will form the innermost core of your bud. 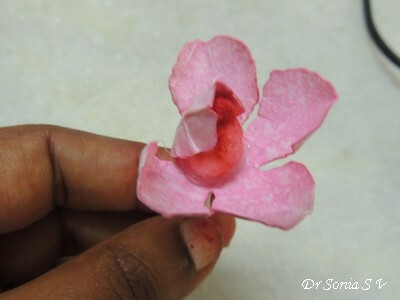 Glue the other petals around this .You can use hot glue if you are adept with it [meaning not prone to burning yourself and not using too much] or use a clear drying adhesive of your choice. 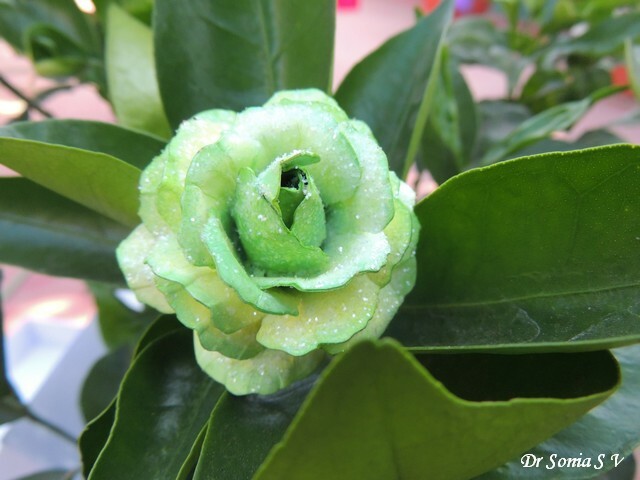 You can either glue the adjacent petals overlapping the edges or glue petals from opposite sides...it just slightly changes the look of your bud and gives a bit of variety! Your bud is now ready ! Add a calyx and its ready to go on a project as it is! 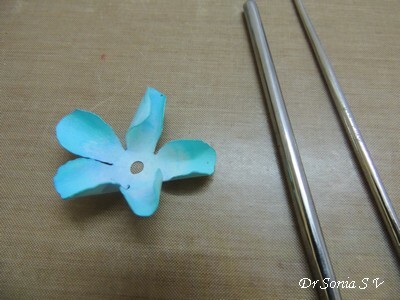 For the layer immediately around the bud, again use the large golf tool and rather than emboss, simply wrap the petals around it like you did before. Optionally, use the pointed tapered end of your 2nd largest or smaller golf tools and gently curve the edges of the petal outwards. 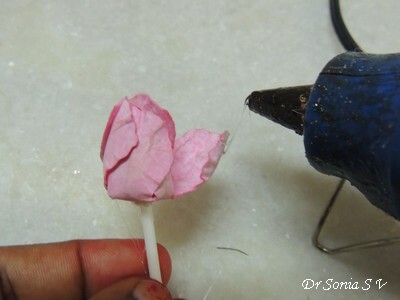 Apply glue on the base and on the lower half of the sides of the bud...you will get a tighter rose! 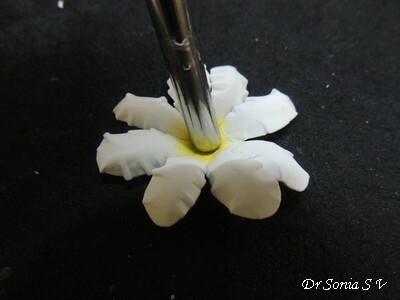 For the outer layers [you can add 2-3 depending on how full a flower you want] use the large golf tool to nicely cup and add subtle texture to the petals. If any area looks stiff ,switch to a smaller golf tool and go over that area. Keep in mind that if you want more embossing anytime switch to the smaller size of the golf tool. 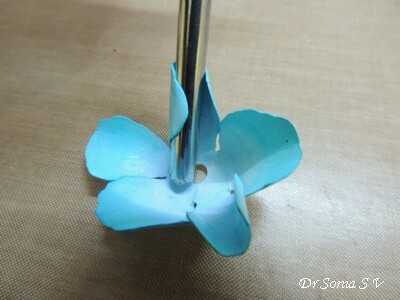 Invert the cup shaped flower and press the center with the round end of the largest golf tool. And so with just 3 die cuts you have made a cute little rose! 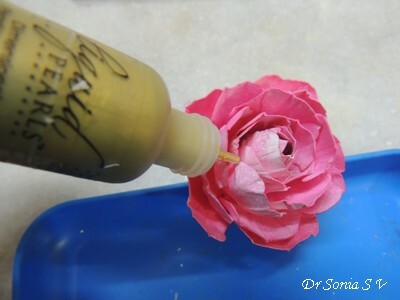 Add more layers if you want a fuller rose . 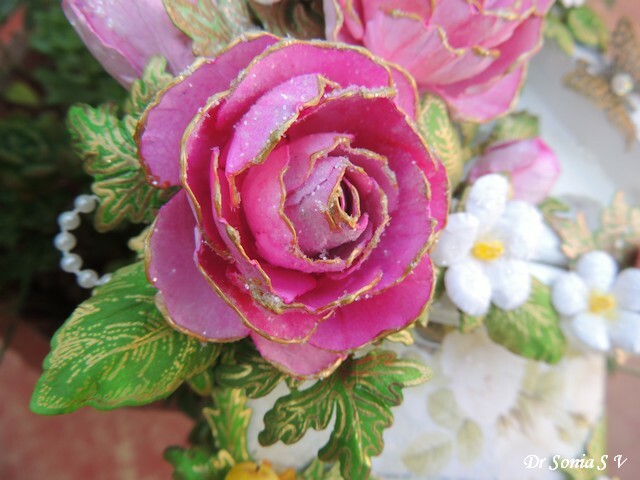 To jazz up your rose...apply adhesive medium [use spray adhesive, crackle paint, multi-medium matte, glossy accents etc] and sprinkle Dress my Craft sparkling dust or frosted sugar. 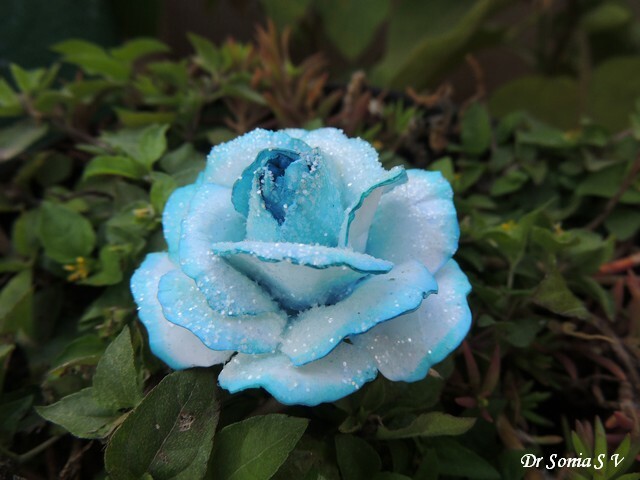 Doesn't the rose look beautiful !!! And the best thing is its not too hard to make !! 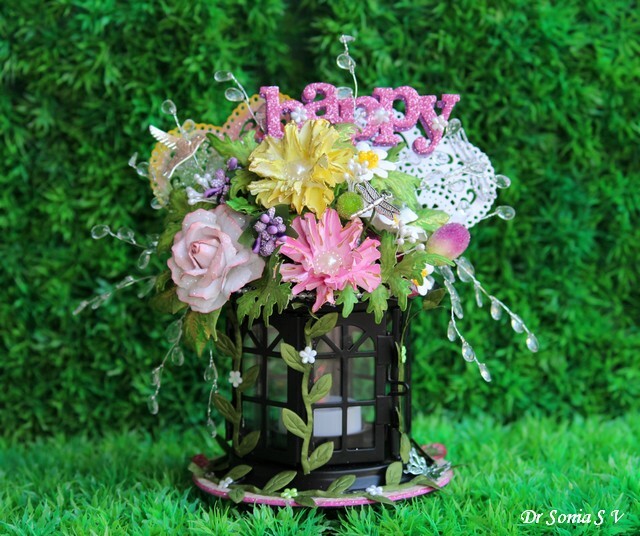 The pink one below is the one I used in the fairy tea light holder. 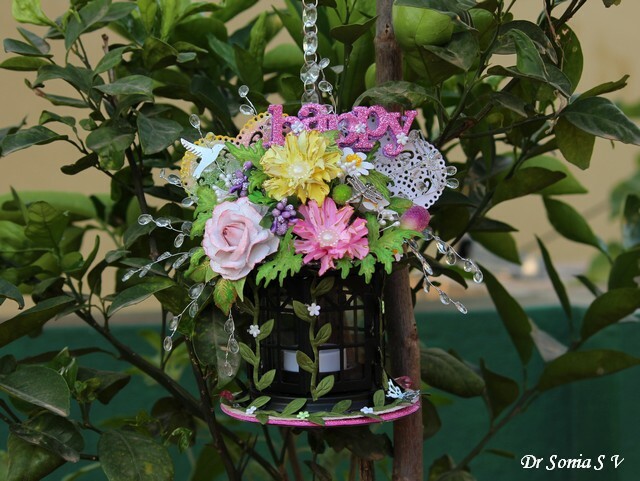 And here is the tea light holder hanging from the miniature orange tree in our home! 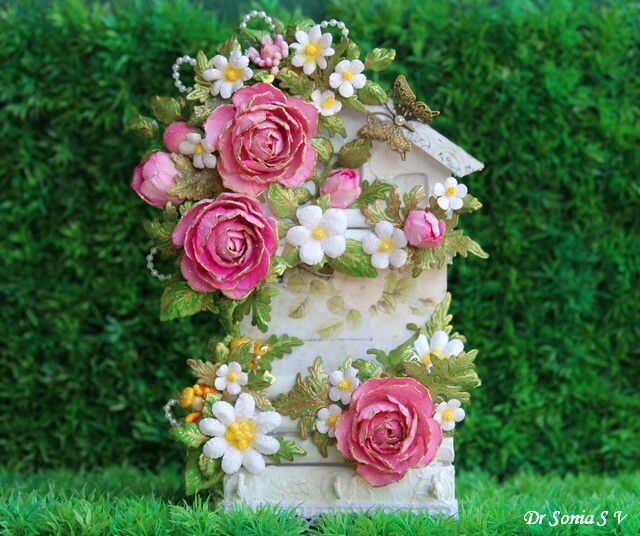 I hope you liked the home I made for the fairies and found some of the flower making tricks I have shared useful. Do tell me how it is. 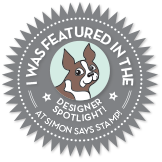 This project was featured in the designer spotlight for the Simon Says Stamps "Favorite tool Challenge "
Hi friends I love making flowers but I was a bit rusty when I embarked on this project since its been ages since I even attempted to make any kind of handmade flower!! 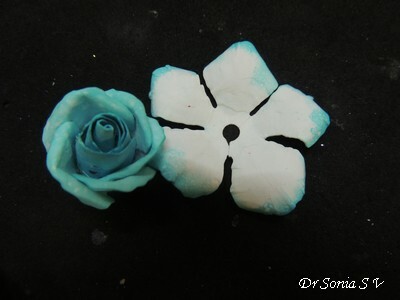 So these flowers are pretty simple and quite easy to make!! 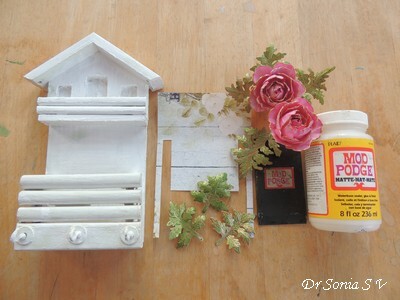 I altered a wooden keyholder which had been languishing in my "to do something with it "stash for years ! The keyholder was originally a pale brown in color . After gessoing and giving several coats of white acrylic paint , I decoupaged it partly with pattern paper[from Bob and Betty]. 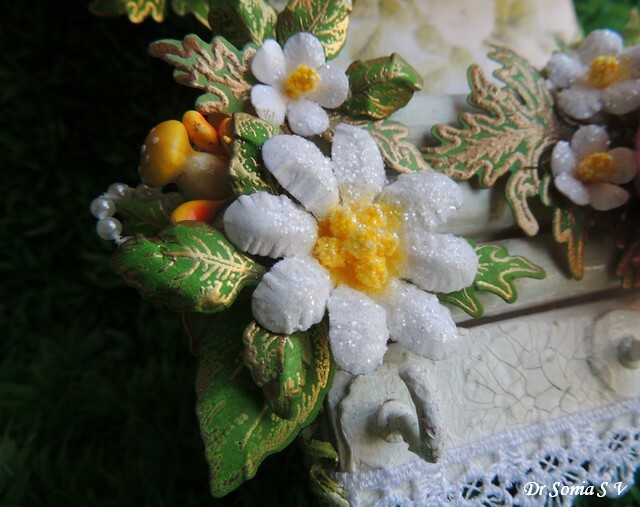 I used a variety of Spellbinders and Heartfelt creations stamps and dies to create the flowers and leaves. 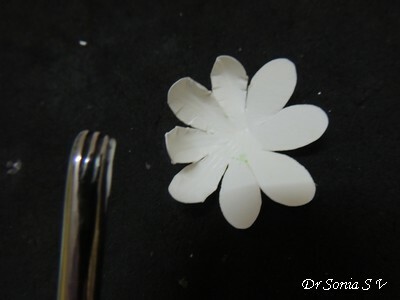 First I will share how to make the cute white blooms which are acting as filler flowers in my project. 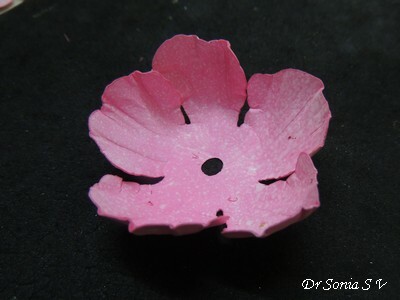 I am often asked what type of paper is best for making flowers. The answer is any type as different papers will give you different effects! 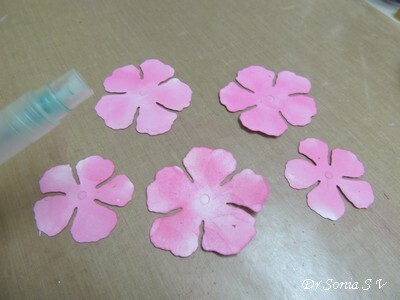 Thin paper is best used with punches and when you want fluffy floppy kind of flowers . 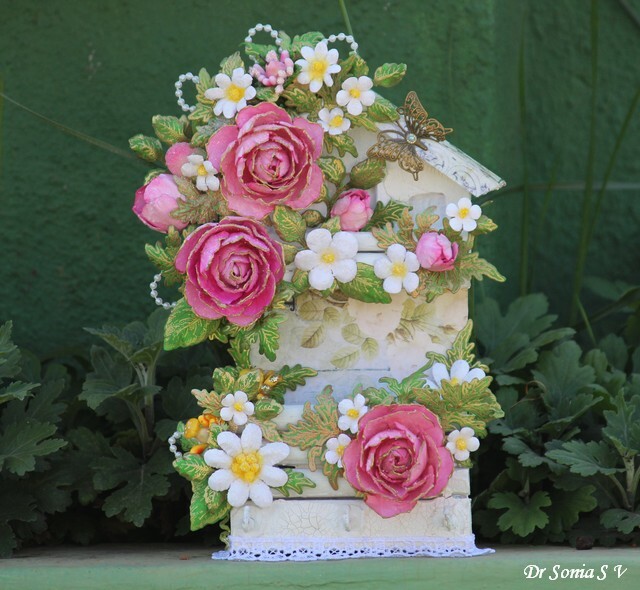 Regular card stock is the most popular type of paper for flower making as its mouldable and fairly durable. 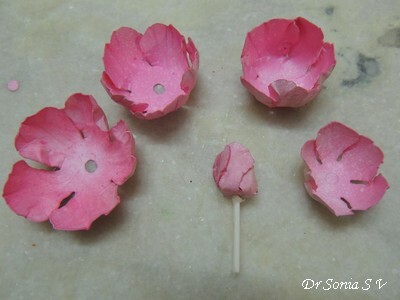 Using cardstock of thickness as high as 285 g to make flowers will give you nice sturdy flowers which hold their shape well and can take a bit of crushing!But because of the thickness they need to be moistened by either misting or dipping in water to allow you to shape and emboss them easily. 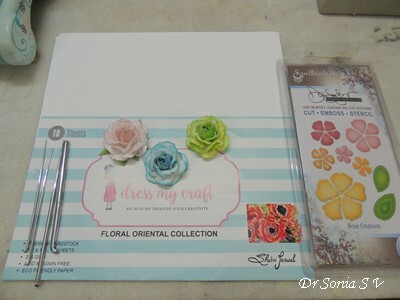 Recently Shalini [under her brand Dress my Craft ] launched 2 gorgeous papers Floral exotica and oriental which are simply fabulous for making flowers!! 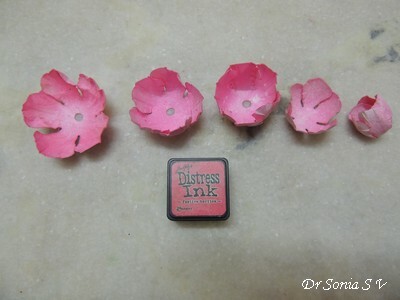 They absorb water to the right degree, are easy to emboss , ink well and hold their shape beautifully !! 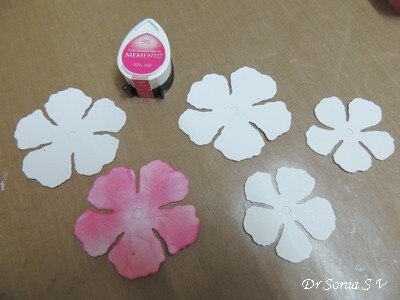 Coming back to the Tutorial : Ink the centers of the die cut /handcut flowers with your choice of color.If you use an Archival ink, it won't bleed when you spritz your flowers with water. Mist both sides of the flower and mop off excess water with a towel. 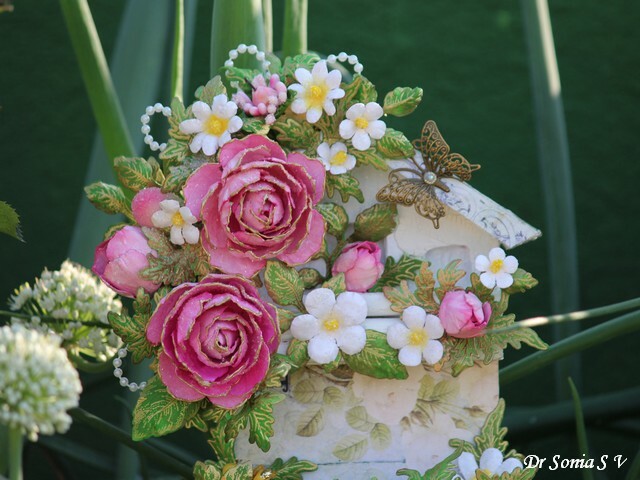 To shape all the flowers and leaves in this project I used a set of fabulous embossing tools called golf tools which have nice grooves on the "golf head" end to help give beautiful creases to your flower while you emboss the petals. 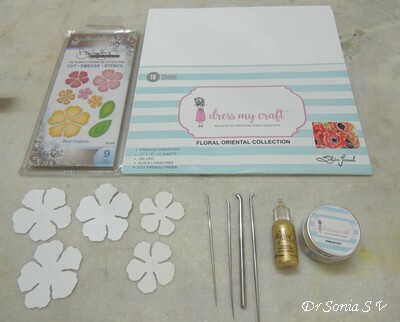 The set has tools of different sizes which you can choose depending on the size of the flower petal / leaf you are embossing and the degree of embossing you want.If you want to curl/cup your petals more...use a smaller golf tool! 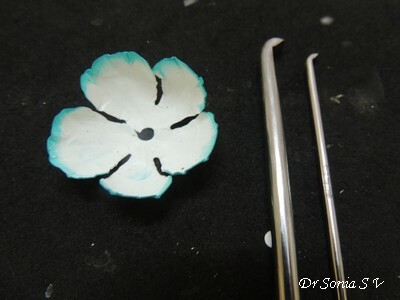 After cupping the flower, invert and cup the center . I have used the round end of the largest golf tool here. 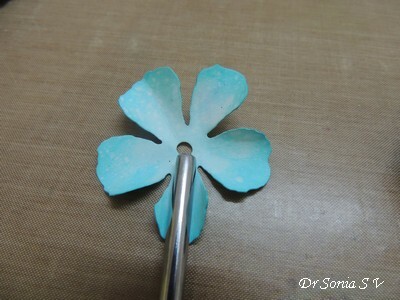 The golf tool ends are nicely tapering so you can actually create a small or larger hole by sliding the flower along the tool! 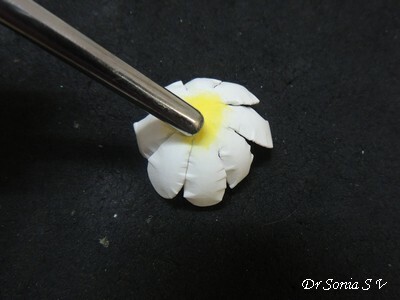 After pulling the pollen through the hole secure in place with a dab of glue. 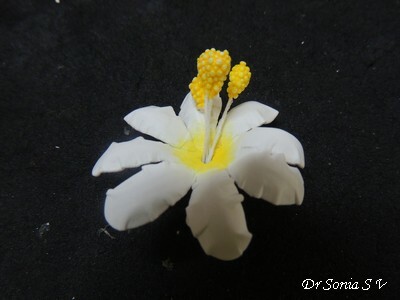 For the large flowers use a bunch of pollen and use just one pollen for the smaller flowers. 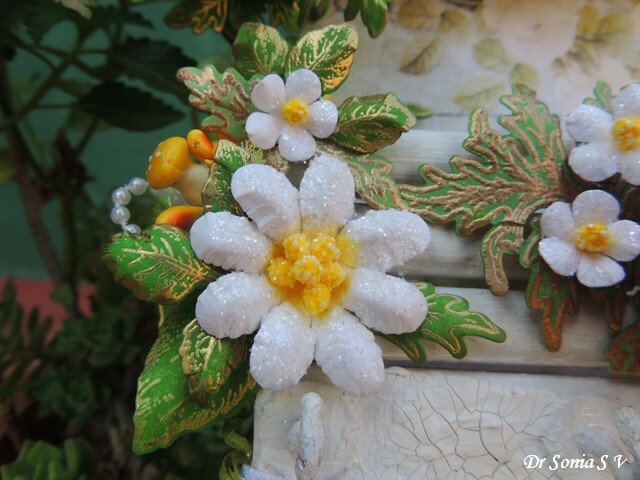 You can quickly further jazz up your flowers by spraying with glue and sprinkling "Sparkling Dust" glitter. 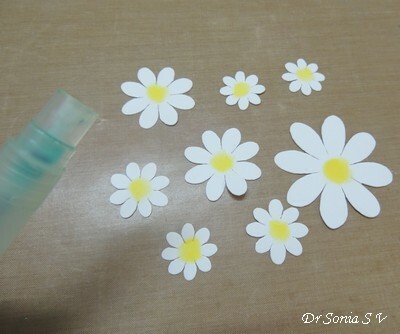 You can also use any clear drying liquid adhesive but I found using the spray adhesive super quick especially if you are working assembly line style and spray a huge lot of flowers and glitter them all up in one go! 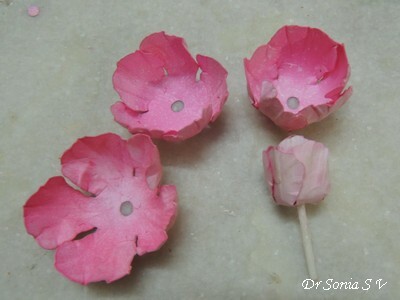 Don't the flowers look simply gorgeous even though they were so easy to make! The leaves were stamped and heat embossed gold using Heartfelt creations stamps and die cut with the coordinating dies. 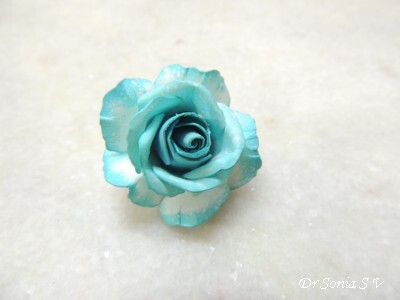 This particular flower is I guess the easiest rose ever! 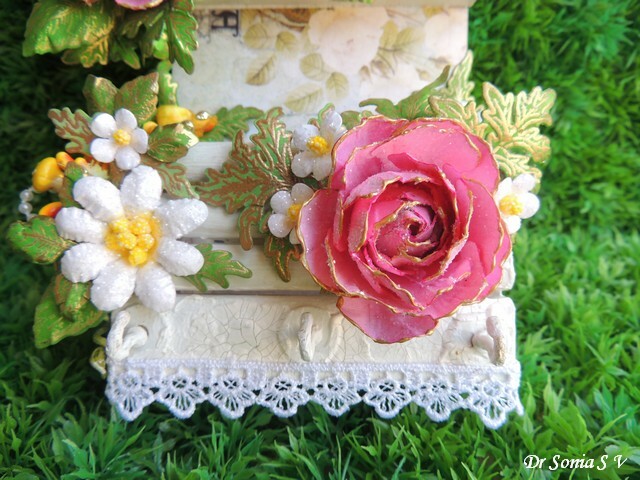 Die : Spellbinders Rose creations die. You can use any other style of die cut. 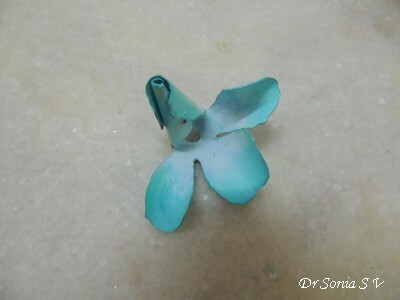 Paper : Dress my Craft Oriental Paper : this one does not absorb water as much as the exotica paper and cups more making it ideal to make this particular flower. I used 3 of the largest and 2 of the 2nd largest size die cuts. 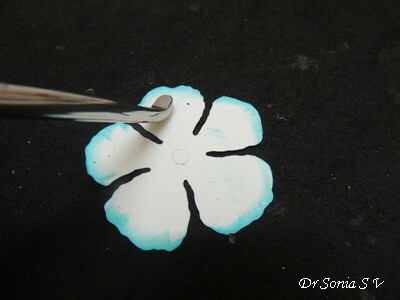 If you are creating 3 dimensional flowers , ink up both sides of the flowers with whatever ink you like. 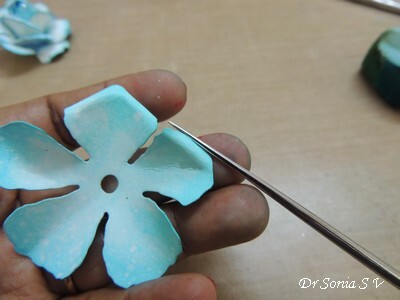 Since you are working with thick card stock you need to moisten the flower shapes to help mould them easily. Mist both sides with water . If you are using a water reactive ink like Memento or Distress Inks ...the color will wash off a bit after spraying and you will also get a nice mottled appearance. If you don't want the color to change use Archival inks. Mop off excess water with a towel. 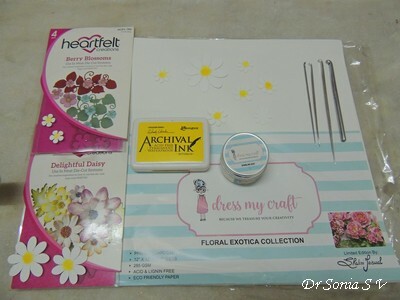 Place the flowers on an embossing pad and run your golf tools over the petals from the edge to the center cupping the petals nicely. Can you see the lovely lines created so easily with the grooves in the golf tool! 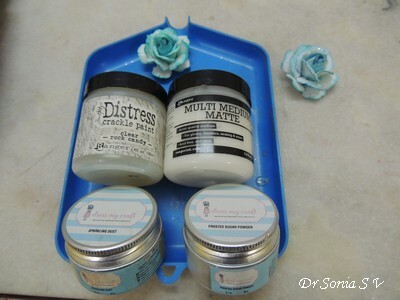 If you want deeper cupping in any area, switch to a smaller size tool and emboss.The advantage of working with a good quality thick paper is that you can apply a good amount of pressure without tearing your paper while at the same time moulding your paper into different shapes. 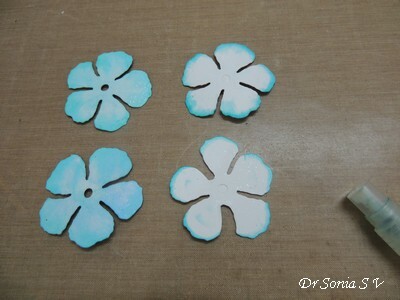 Vary the degree of cupping of all 5 flowers using the embossing tools and cupping with your hands. Optionally ink over the grooves created to enhance the lines even further using a darker shade of ink. 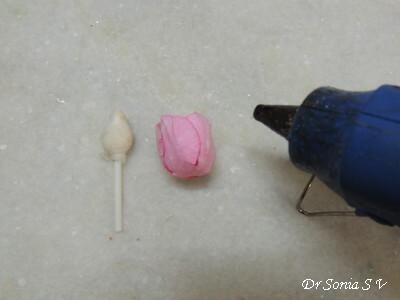 Glue the petals around the earbud/cotton ball etc using hot glue. 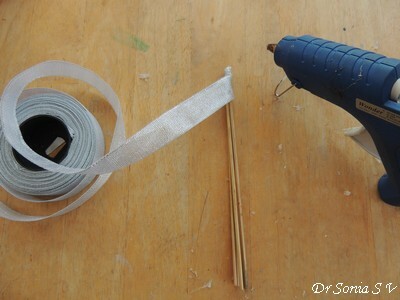 You can also use any other kind of glue but you need to be more patient! 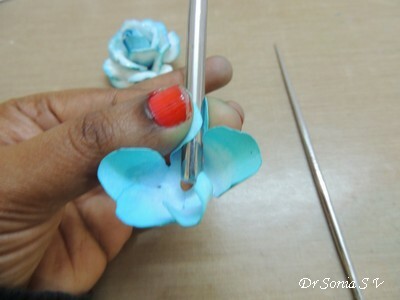 The trick while using a glue gun to avoid those pesky glue strings is to avoid glue towards the top edge of your petals ! 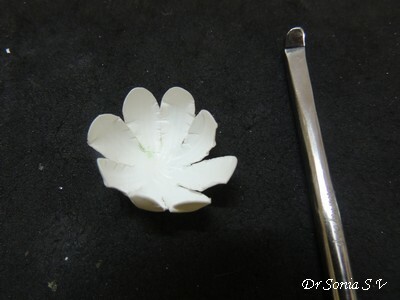 Glue the petals overlapping each other, keeping the shape conical. 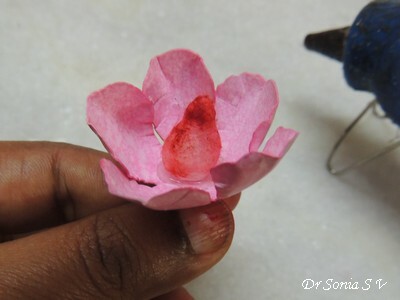 Glue the bud with in the other layers of flowers staggering the petals as you keep gluing. 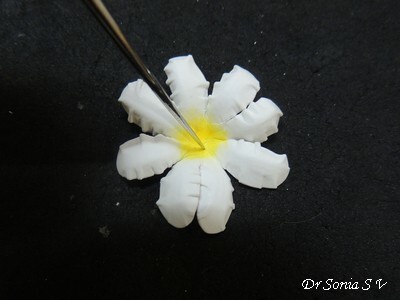 As you move to the outer layers apply glue only on the central areas and less on the petals as such so that you get more of the flared effect. Finally add your finishing touches! 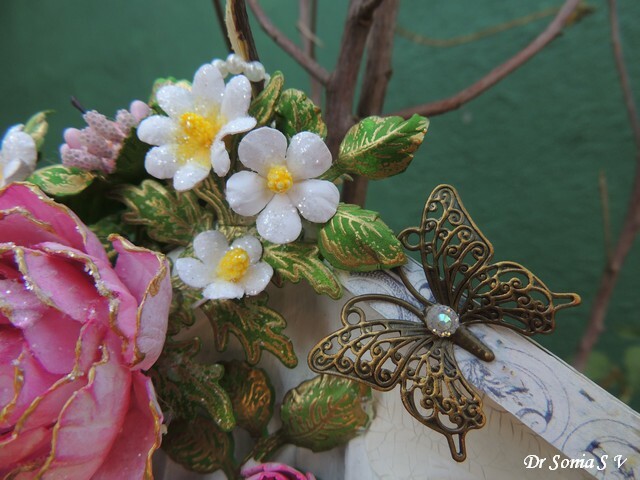 I used golden liquid pearls over the edges of the flower . 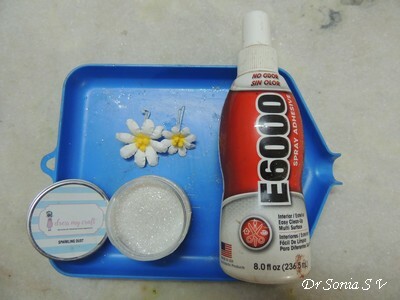 Once the liquid pearl is dry , paint with liquid glue or spray with spray glue and sprinkle Sparkling dust glitter. 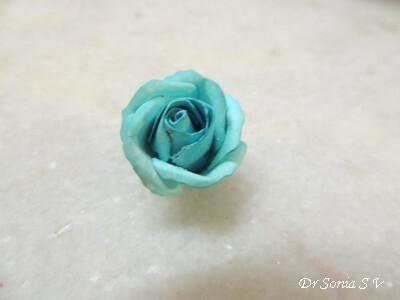 Wasn't that the easiest rose ever! 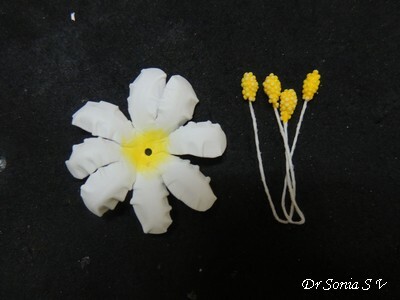 I hope you liked the easy flower making techniques I have shared .